If you had told me five years ago that I’d be starting over when it comes to friendship, I wouldn’t have believed you. I was leading a moms’ group, active in my church, and had a circle of close friends that I hung out with on a regular basis. We were all stay-at-home moms, and at least four of them lived nearby. We frequently traded babysitting to run errands or to go to appointments. We met up at parks, each other’s houses, and Chick-Fil-A for lunches and playdates. We laughed together and supported each other through parenting. These were my girls. Our kids moved into elementary school, and a couple of my good friends went back to work. Another couple of them moved away. I had another baby, and all of a sudden, I was starting the parenting journey over again while my friends were moving into a new season of life. After I had my little girl, I stepped down from leading the moms’ group, and my family started attending a new church. Even though I still considered those girls my close friends, our lives didn’t overlap as much as before. Our paths didn’t cross unless we could find time in the middle of our families’ busy schedules to get together. When it came to friendship, I was back at the starting line. And it felt hard. And vulnerable. And exhausting to think about starting over again. Maybe you’ve been there, too. Maybe you’ve just moved to a new city. Or you’ve just had a baby and don’t know any other young moms. Or, like I did, you’ve entered a new life stage or you’ve started attending a new church. 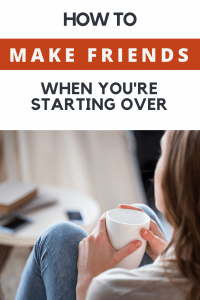 Whatever transition you’re in, I want to offer you encouragement as you start building friendships again. 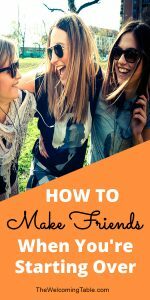 In this post, I want to share with you 3 basic things that you can do to make friends. 2. Spread a wide net. 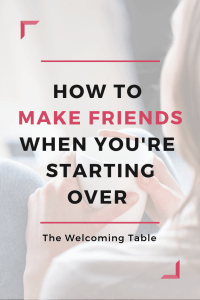 How to Make Friends When You’re Starting Over? Do you ever look back with nostalgia at your childhood friendships and wonder why it’s so much harder to make friends as an adult? When you were a kid, friendships were kinda just built into life. You spent hours together every day at school, you hung out in your neighborhood, you played soccer or softball together, you went to each other’s houses for play dates and sleepovers. Your lives overlapped in many ways. As an adult, your life is a lot more compartmentalized than it was back then. Friendships don’t just happen — you have to be intentional about developing them. That means putting on a friendship-building mindset. Have you ever noticed how when something is on your mind or you’re about to make a big purchase, you start noticing it everywhere? Like, maybe you’re thinking about buying a new car, and all of the sudden you start noticing all of the features of the cars you pass? They were there all along, but you’re just now really seeing them. Friendship is the same way. You interact with people every day, and yet, unless you’re intentionally thinking about it, you don’t see those interactions as potential moments for building friendship. But if you “put on” a friendship-building mindset, you start seeing all of the opportunities around you like the friendly woman you talked to at the library. Or the neighbor you pass on your walks around the block. Or the mom you talk to at your daughter’s gymnastics practice. Once you notice those opportunities, challenge yourself to make the most of them. Ask if she’d like to go grab lunch after practice is over. Or invite her to your house for lunch and a playdate. Friendships don’t just happen — you have to be intentional about creating them. 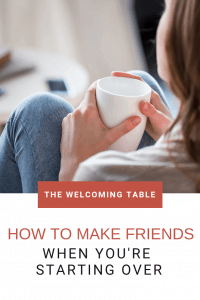 Shasta Nelson, author of Friendships Don’t Just Happen and Frientimacy, introduces this concept on her blog. When it comes to making friends, you can either drop your fishing line into the ocean and just hope that the right person comes along OR you can use a net and connect with a wide variety of people, giving yourself a greater chance at developing the friendships you need. 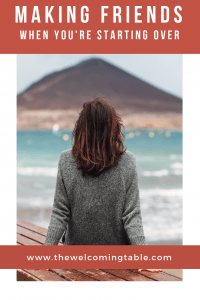 I’ve been doing this with women at my church, moms of my kids’ friends, and moms I meet at my MOPS group, spending time with a wide variety of people in different kinds of circumstances. And just in the last few months, I see those seeds really starting to grow. Spreading a wide net means saying “yes” to a lot of different kinds of people. 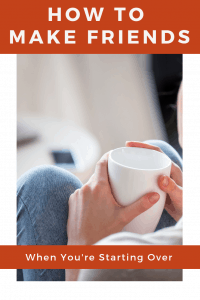 It means not turning down an invitation to coffee with that mom who reached out to you, even if you don’t think you naturally “click” with her. It means planting seeds of friendship and seeing which ones grow with time. One of the best things you can do to help those seeds of friendship grow is to create some regular time to spend with your new friends. Think back on those childhood friendships. One of the biggest things that contributed to them being great is the fact that you saw your friends so often in so many contexts. You have to create that consistency as an adult. Sometimes this happens naturally in settings where you see someone weekly, maybe at a moms’ group, an exercise class, or a playgroup. But a lot of times, it comes back to being intentional. You have to schedule in regular time with the people that you want to get to know. Ask one of your new friends if she’d like to start getting together once a week for lunch at your house while the kids play. Invite a small group to get together twice a month to swap recipes or to visit over dessert. Or pick a parenting book and invite someone to get together and discuss it, one chapter a week. A friend of mine and I used to get together once a month to talk about our monthly goals. Two of my friends bonded when one spent hours helping the other paint her house. It doesn’t really matter what you do as long as you’re spending time together consistently. In our fast-paced society, we want things to happen quickly. But building friendships can take a long time. It doesn’t feel “productive” because it’s on its own time table, and that can feel discouraging. When you feel frustrated with how long it’s taking, look back on the relationships you had in the season you just left. Reach out to those friends through texts, voice messaging or phone calls. Catch up on life and let them know how much they mean to you. Remind yourself that you’ve made great friendships in the past and that they started small — just like the ones you’re developing now. After you’ve taken time to look back, refocus on the present. Building friendships is a collection of moments, and yes, it can take a long time. But there’s a lot to enjoy along the way. Be present for each conversation, each interaction, each bonding moment. Trust the process. Enjoy the small seeds that you plant, knowing that eventually, you’ll see them grow into something bigger, just like the friendships you’ve had in the past. So if you’re in some kind of transition, put these four tips into practice: be intentional, spread a wide net, create consistency, and be patient. It will take some work, but over time, you’ll find yourself developing friendships that will last. 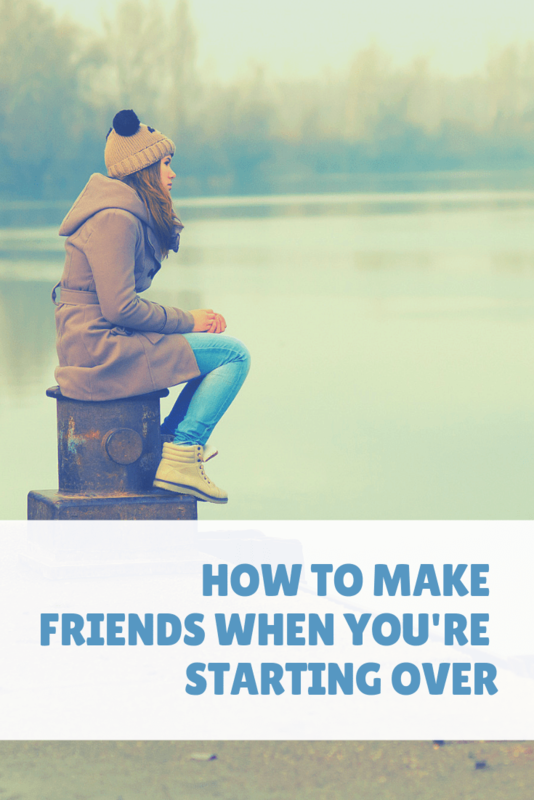 Have you gone through a season where you had to start over in friendship? What was it like for you? Share in the comments below.